Home > Uncategorized > ASOS Feature! Hello! So you may have seen me mention in outfit posts etc about my recent collaboration with ASOS, probably the most exciting opportunity my blog has brought me to date. 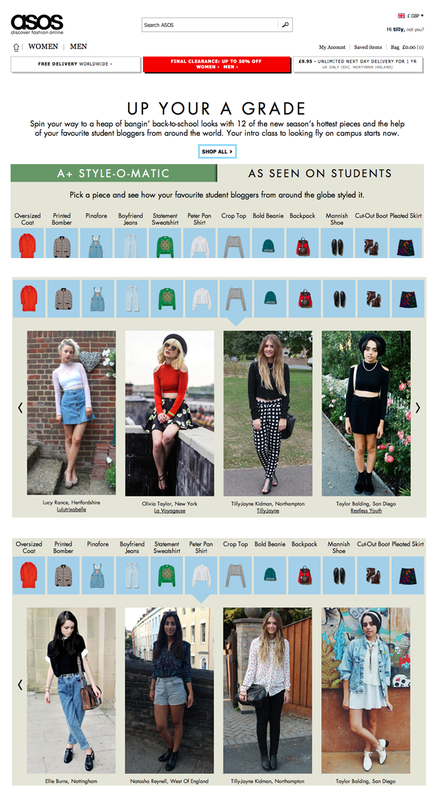 So I took part in their student style campaign, styling up ten key pieces from the ASOS site which was so fun! I currently study Fashion Marketing at Northampton Uni incase any of you didn’t know. Here are a few screenshots so you get the idea, but check out the full feature HERE! The bank holiday weekend flew by in a weird blur for me, I felt so under the weather which meant a lot of it was spent under a blanket on the sofa. I did manage to drag myself out a couple of times for lunch and a quick bit of shopping with Charlie as he’s off to Ibiza (pfft). I picked up a few new Autumnal bits and pieces but I didn’t get a chance to take any outfit photos as I just really wasn’t in the mood! A mix of feeling crap/looking pale/random breakout on my skin meant it was just a no go. More from me towards the end of the week, I’m still interning at Oh My Love and I keep meaning to put together an internship post! Uni is creeping up and I’m not sure how I feel about that haha, I can’t believe the 6 month summer is nearly over. Though you can’t really call it a “summer” more a half year break.